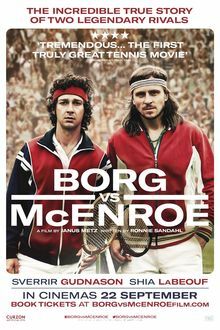 Borg vs. McEnroe is an upcoming Swedish biographical film focusing on the famous rivalry between famous tennis players Björn Borg and John McEnroe at the 1980 Wimbledon Championships. The film is directed by Janus Metz Pedersen, from a screenplay written by Ronnie Sandahl, and stars Sverrir Gudnason, Shia LaBeouf, Stellan Skarsgård, Tuva Novotny, and Robert Emms. Read more on Wikipedia.